Television director Eric Dean Seaton continues to break stereotypes of African Americans in science fiction and fantasy with his third book in the "Legend of the Mantamaji" graphic novel series. Drawing on his experience as a successful director in Hollywood, Seaton crafts a thrilling story that supports the simple notion that the world needs to see that people of color can be superheroes and save the day with all of the fun, action and history found in any other popular comic today. When people think of superheroes and science fiction, they often imagine the strong chiseled features and extraordinary powers demonstrated primarily by white male characters. Critically-acclaimed television director Eric Dean Seaton wants to remind comic book and sci-fi fans that Black people can be superheroes, too. With the launch of his third book in the Legend of the Mantamaji graphic novel series on February 11th [available at Barnes & Noble bookstores, comic book shops and online at Amazon.com, iTunes, Comixology, etc. ], Seaton hopes positive representation of people of color in comics will go a long way to shatter stereotypes about Black involvement and interest in science fiction and fantasy. Books One and Two were named "Top Graphic Novels of 2014" by Examiner.com and Atlanta Black Star. With Book Three's release just days away, the success of the series shows no sign of slowing. "Science fiction and fantasy stories give people of all ages something to dream about. What does it say to children when the only heroes they read about are white?" Seaton, whose television hits include Disney's Austin & Ally, NBC's Undateable and Nickelodeon's Bella and the Bulldogs said. "Black people do survive the zombie apocalypse, people of color exist in the future. They don't have to be the first person the monster eats. And our interests go beyond civil rights and slavery. Our history is incredibly important, but so are our dreams and creative imaginings. Legend of the Mantamaji is first, a really great story with lots of action, fun plot twists, a rich history and well-rounded characters. The characters are as diverse as the world around us. It's a point of view that really isn't represented regularly in the comics and literary world. " The third book in the Legend of the Mantamaji series tells the story of Elijah Alexander, an Assistant D.A. 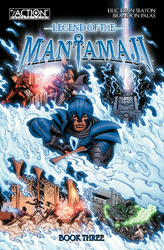 who has learned that his childhood storybook of legends are actually the true stories of his heritage and that he is the last of a race of mystical knights known as the Mantamaji. After realizing he's only part human, Elijah has struggled with the shift in his world and becomes a hunted man charged with ridding the world of an ancient evil no other Mantamaji has ever been able to defeat. The full-color, action packed series has hair-raising plot twists and smart storytelling for all superhero fans ages 9 - 99. As an episodic director, ERIC DEAN SEATON has directed 195 television episodes of 38 different shows, 18 music videos and two pilots for Nickelodeon, as well as two pilots for Disney XD. He has also directed episodes of the NBC/Warner Bros. comedy Undateable, TBS's Ground Floor, BETs Lets Stay Together and Reed Between the Lines. He is a Cleveland, Ohio native and attended The Ohio State University. Eric, his wife, son and daughter live in California. LEGEND OF THE MANTAMAJI is his first graphic novel series.